Universal Rolling (Unirol), which stakes claim to being Bahrain’s biggest rebar producer, is planning to upgrade its facilities, and increase in production to wean the local market off rebar import. 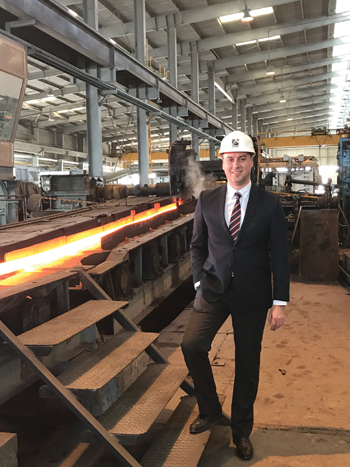 The company resumed production in February 2017 under a new ownership and management, starting with sizes ranging from 12 to 32 mm. Last November, it introduced the 10-mm size, in a bid to complete the range it offers and add value to the local construction sector by being a single source provider of rebar, Ali Der, Unirol operations director, tells Gulf Construction. With a plant capacity of around 200,000 tonnes per year, Unirol has the capability to produce any quality/grade found on the global market due to its strong billet procurement ability. Its current quality is certified to meet Bahrain’s construction sector requirement, which is BS 4449 Gr500B. Unirol products comply with international standards and the company continues to strive to further enhance its quality. It is already certified by the Ministry of Works and ISO for 9001:2015 quality management system and is currently in the process of renewing its certification from UK Cares, which Unirol expects to obtain soon. “Having such a high accreditation as UK Cares – the highest product quality recognition in the world – is a further assurance about Unirol’s commitment to provide prime products to serve Bahrain’s growing industry and economy,” says Der. He says Unirol keeps a good stock of every size which gives it immense flexibility to deliver within hours to customer stockyards or construction sites. This also means customers can keep less stock and manage their stock levels and finances in a more efficient way. Being local also enables it to offer a quick after-sales service. In addition, its strong position keeps the market prices stable for consumers, to whom it offers attractive payment options. Commenting on Unirol’s expansion, Der says discussion are under way with several engineering companies to upgrade its production facilities. “The main aim behind the upgradation is to reduce imports of semi-finished products with a local supply,” he says. The upgrade will see Unirol’s production capacity and efficiency increase and will help create many jobs. It will also enable Unirol to utilise billets produced by a local manufacturer, which it is unable to do now because of technical limitations. “Hence, following the upgrade we will be able to produce 100 per cent ‘made in Bahrain’ rebar,” states Der. Commenting on exports, Der says Unirol’s primary role is to serve the Bahrain market. “Bahrain spends around $150 million every year on importing rebar. This is mainly due to the lack of reliable production in the local market meeting international standards. In these circumstances, it is our duty to serve our country first even if there are better opportunities in other markets. We will continue to concentrate on Bahrain until we have a stable local market,” he says. Regarding business, Der says 2017 witnessed a significant boom in construction projects mainly due to some big projects like the Bahrain Airport Modernisation Programme and Alba expansion, among others. And although Unirol commissioned its factory only last year, it has secured a good market share. Unirol supplies to both private and public projects. It meets the approvals of the ministries of Works and Housing. “Since our product is being supplied nationwide, today you will find our products in every project under way – from a simple house to a high-rise buildings or industrial construction,” he concludes.